Day 3 of the positivity experiment and I must say it is going great. Instead of it being just on my blog, it has become a movement now! So many people are doing it on their blogs and it has caught on so well! I am very happy with all the positivity that has started because of this experiment and yes it is indeed hard, like many of you (including myself) discovered. I have tried to visit all of you who left a comment saying you have done it on your blogs. I will reply to your comments in yesterday's post too, tomorrow when I take a break from working on my 2nd book which is in editing stages. Bharti of Life begins has even made two beautiful positivity badges and she sent it to me .Here is one of them. 1.One of my closest friends whose opinion I value a lot, said that this was indeed a wonderful thing I was doing and he said that it reminded him of the movie 'Pay it forward' which happens to be a movie I really liked. (Watch it if you haven't already) I felt very good about it. I wrote a comment which said "The world also makes way for a man who has eaten too much Garlic :P :D hahahahahaha "
I laughed for a full 2 minutes at my wickedness :P :D Then I happily narrated it to two other good friends on the phone and they laughed as well. I feel very grateful for my quick wit and my ability to make people laugh. 3.It rained today and I got completely drenched in the rain when I went to pick up my daughter. I absolutely loved it! It has been a long long time since I got completely wet in the rain. :-) Have you ever got drenched, completely soaked in the rain? Do you like it? (some people just hate it) But I revel in it and it makes me feel so alive! I feel grateful for my ability to enjoy Nature. 4. An unexpected ping from Prashant cheered me up a great deal. (and he is always in invisible mode :-)) He pinged saying "you've got mail" :) Incidentally, he has written a story which made it into the 'finalists club of 250 word fiction' chosen by Jason Evans(which is truly a big deal as the competition is worldwide) His story completely blew me away. I absolutely loved it. If you want to read it click here. I really like the way he writes his mails too and we mail each other regularly. I feel grateful for having talented and smart friends :) Click here to see a portrait of him that I had made. 5.I feel grateful for all the people who sent 'wishes' and 'smiles' and 'cheers' my way. So many mailed and pinged to ask how I am doing and whether I am still feeling down or to simply say 'Hang in there'. I feel 'wow' about it. So many people actually care! I appreciate and am grateful. Focussing on five small things is indeed working very well. It is difficult but it can be done. Want to join in? You are most welcome but do link back to this post if you are doing it in your blogs, or else do it in my comment box. Dive in! Don't be an onlooker! This is really working! :-) I feel happy and blessed. 1. My tea boiled over but there was still enough left to fill about 75% of the cup. 3. Thankful to be able to work from home as I am down with a runny nose and a sore throat. You sound so much better than the first post :D and lovely bullets from today as well. Thank you so much for the kind words :). You are really lucky in many ways. So good to see the "positivity fever" catching on :). Positivity. Yeah! That is what sets your blog apart, ma'am. Thank you for starting this, Preeti. May you spread more happiness through your writing. Ah, a walk in the rain is one of the greatest pleasures of life. "There are people who dance in the rain; and there are people who just get wet." I am one of those who does not like to get drenched in rain. Thanks a lot for mentioning my name. Am glad you liked the badges. Hope things are better at your end. Thanks for spreading the positivity! tea from the book Connect The Dots- by Rashmi Bansal. 2) had super tasty Idli,Vada & coffee for breakfast. 3) had informal chat with my project manager which was really refreshing. 4) read muttiah muralitharan intw in DH.felt inspired again. 5) watched a hindi comedy movie while having dinner. Palsworld: happy u started it too! Pink Dogwood: welcome to the club! Ruch: oh we are! I look forward to seeing you! Vibhu: :) welcome to my blog! Life begins:Thanks for making them! Manikandan:wlecome to my blog and thanks for joining! Anish: happy day to u too! AD: only four? and i like the way you looked at still 75% left. Nice! 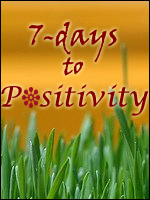 Hi Preethi, This is such a great way to remain positive and to spread it! I can witness that this concept is contagious(in +ive sense). I am into this! I always tried hard to go by this quote which one of my friend has on her chat status "Everyday may not be good but there's something good in everyday"